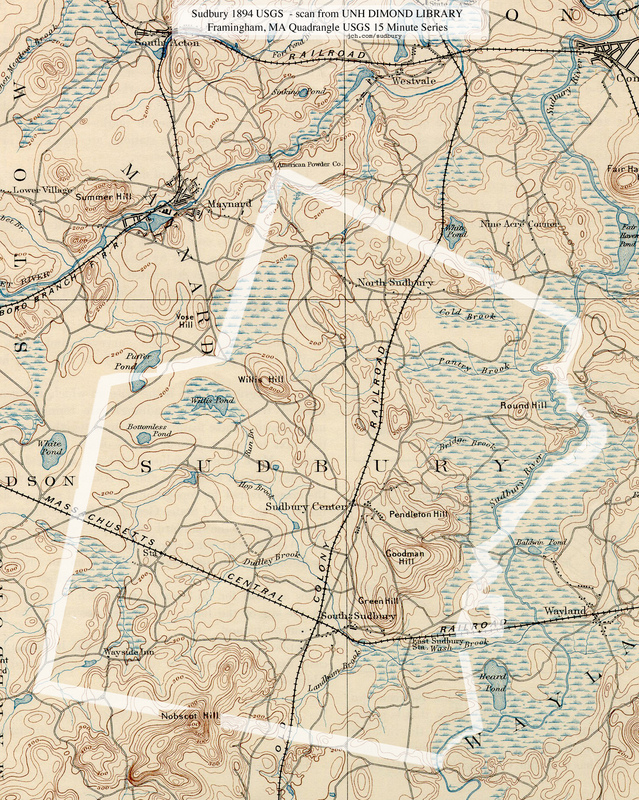 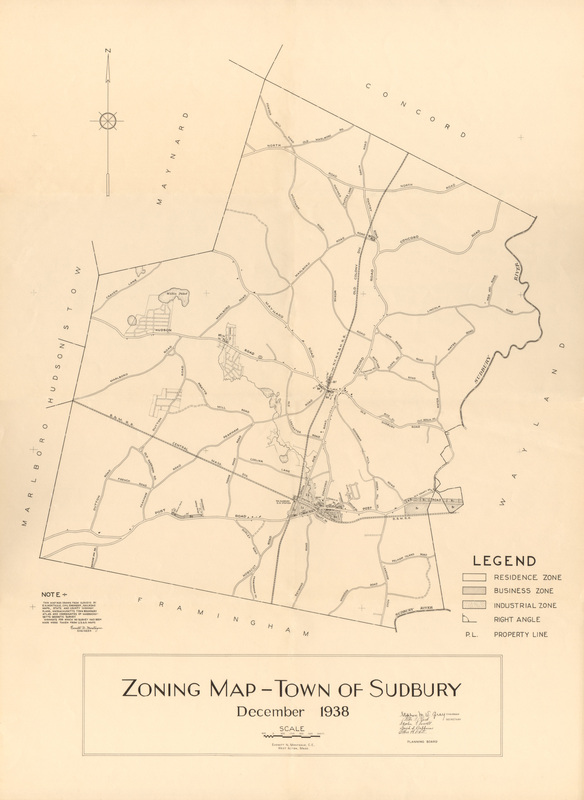 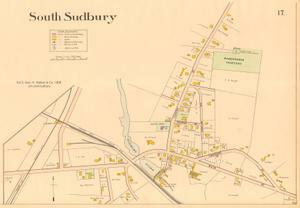 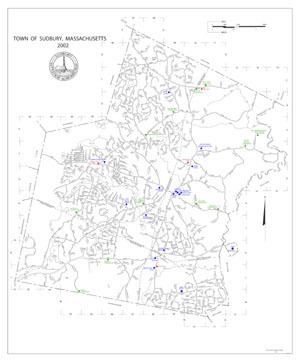 Detailed maps of the whole of Sudbury chronologically: 1795 Mosmon, 1830 Wood, 1856 Walling, 1875 Beers, 1889 Walker, 1894 USGS Topo, 1908 Walker Atlas, 1938 Zoning, 1943 USGS & modern Town Map. 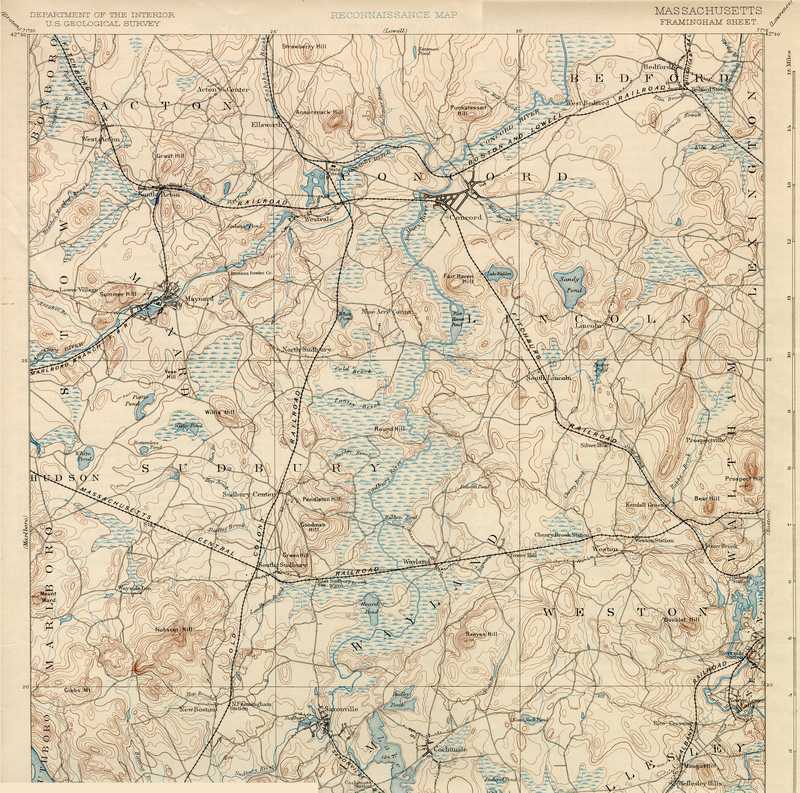 The range of time between each map is interesting: 35, 26, 19, 14, 5, 14, 30, 5. . .
its land for this purpose. 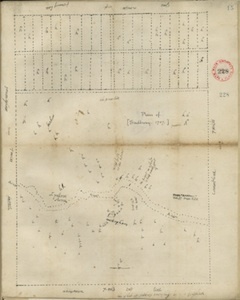 1707 Brigham. 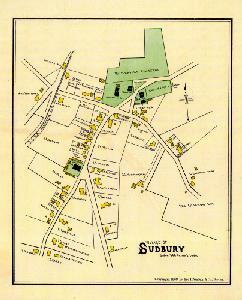 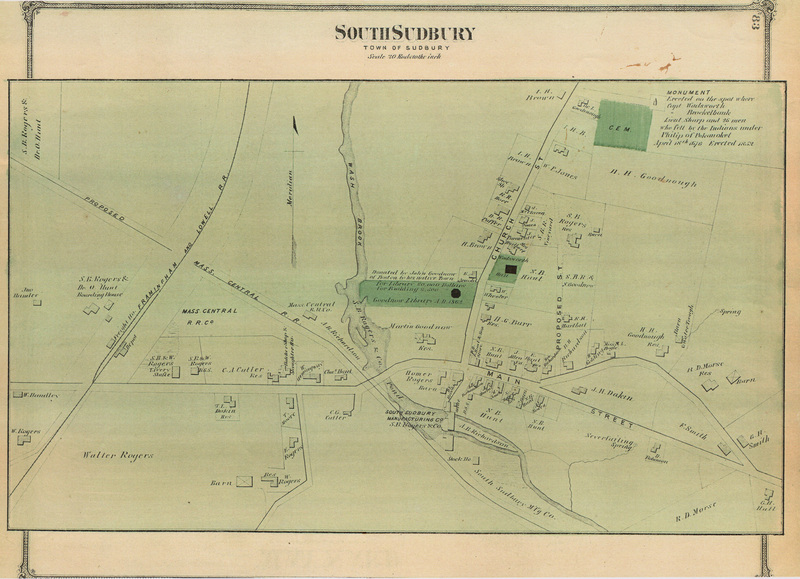 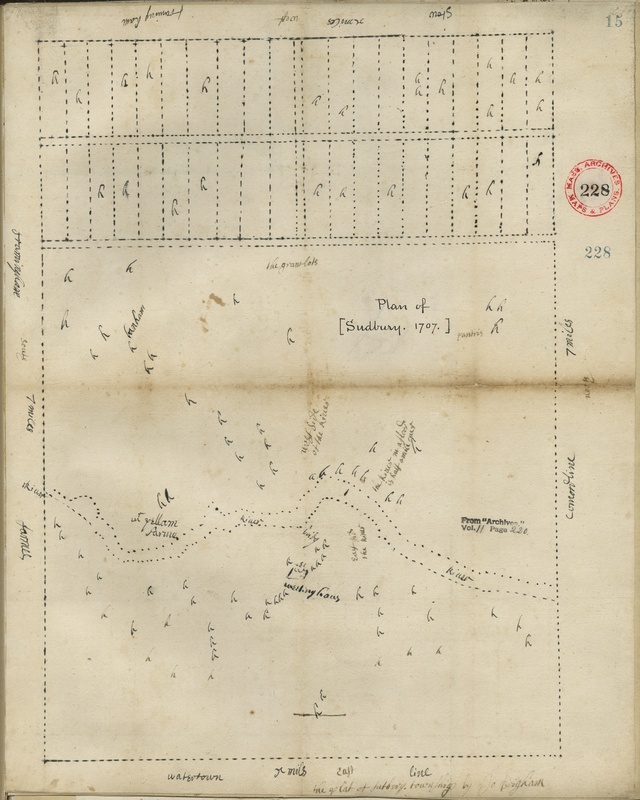 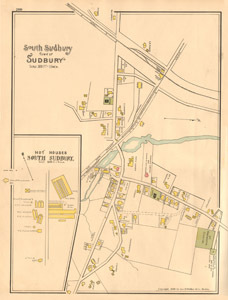 the plat of Sudbury Township by Jo Brigham. 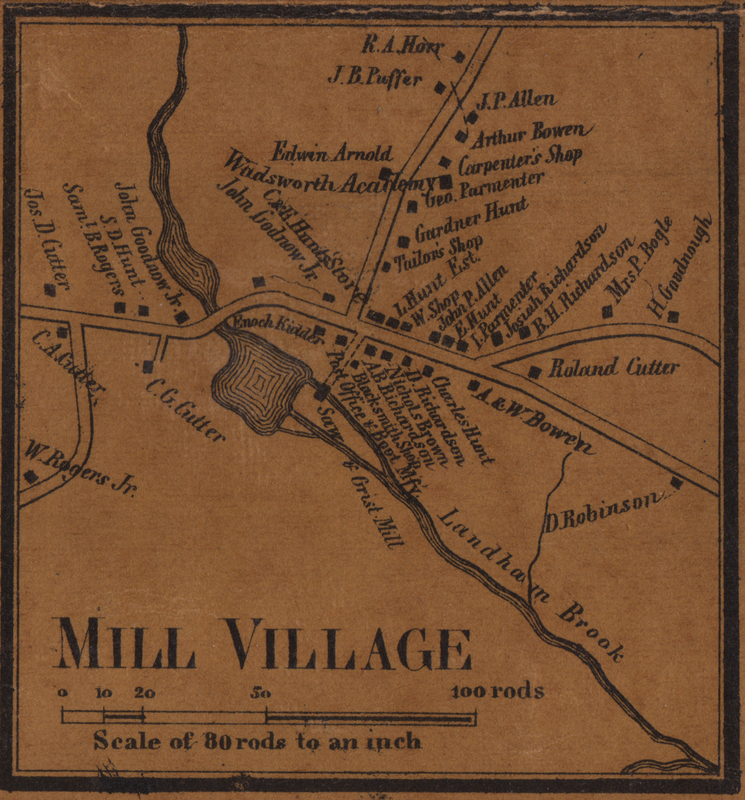 Shows the river, meetinghouse, lots, "the river in a flood if half a mile over"
1720 Neal, Daniel. 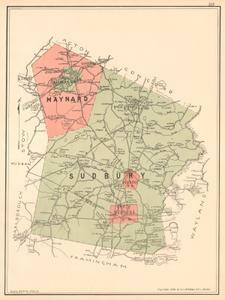 A Map of New England According to the Latest Observation. 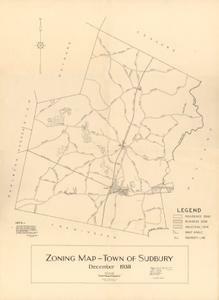 Shows Sudbury as a dot. 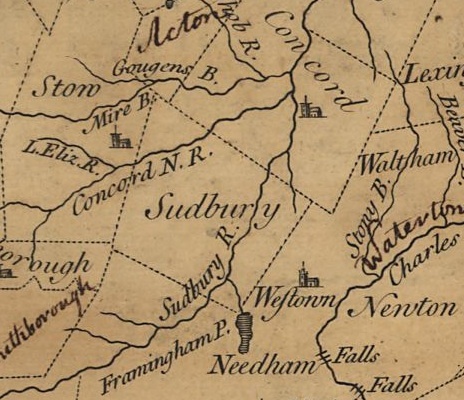 1785 Accuurate Map of the Four New England States. 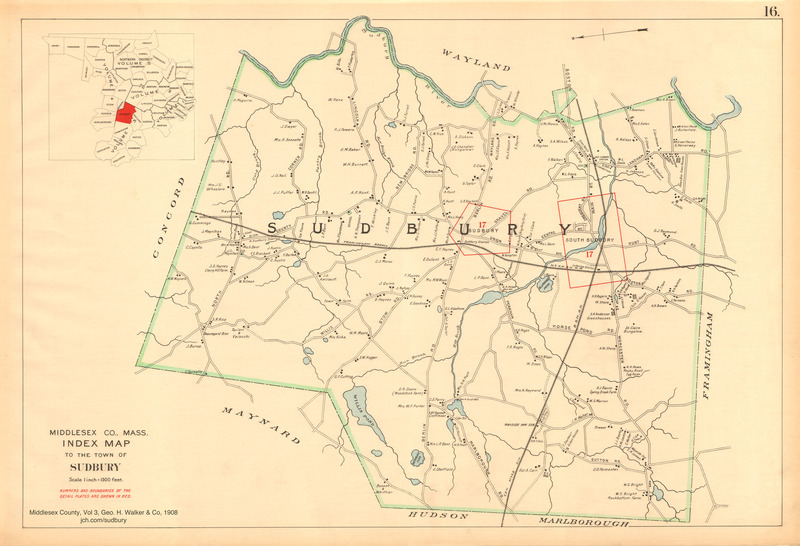 John Norman, Sudbury and Boston Post Road. 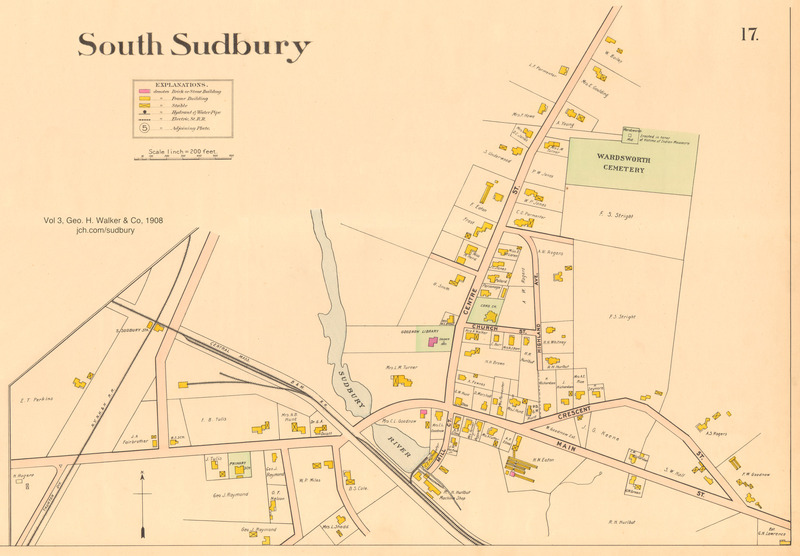 Is Mathias Mosmon the same person as Sudbury resident and Revolutionary War veteran, Mathias Mosman? 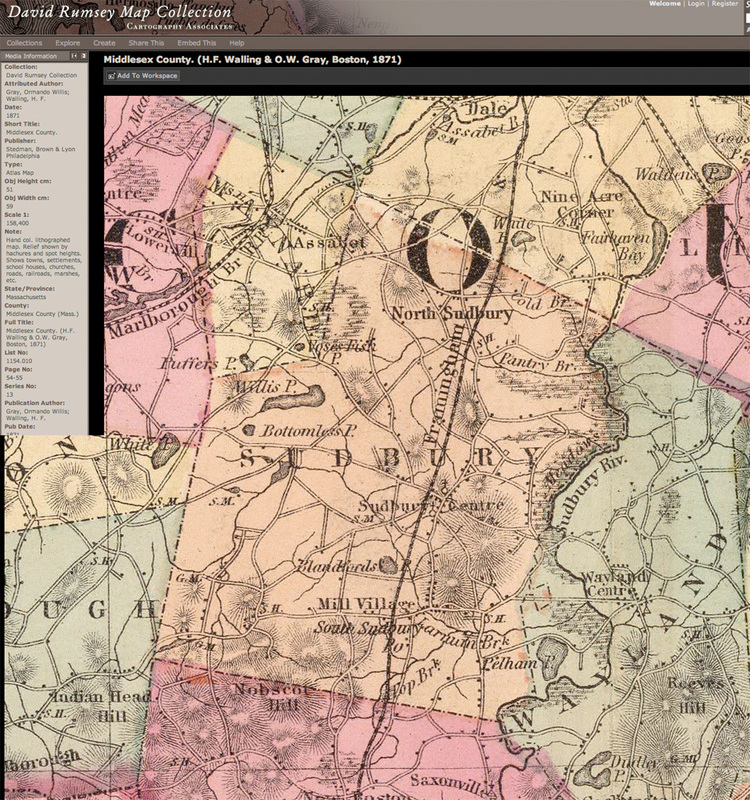 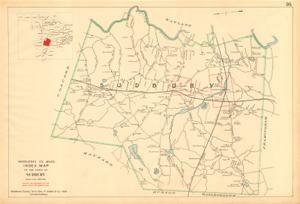 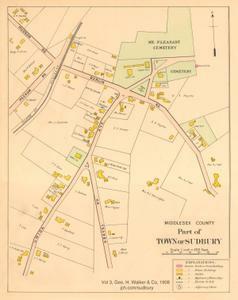 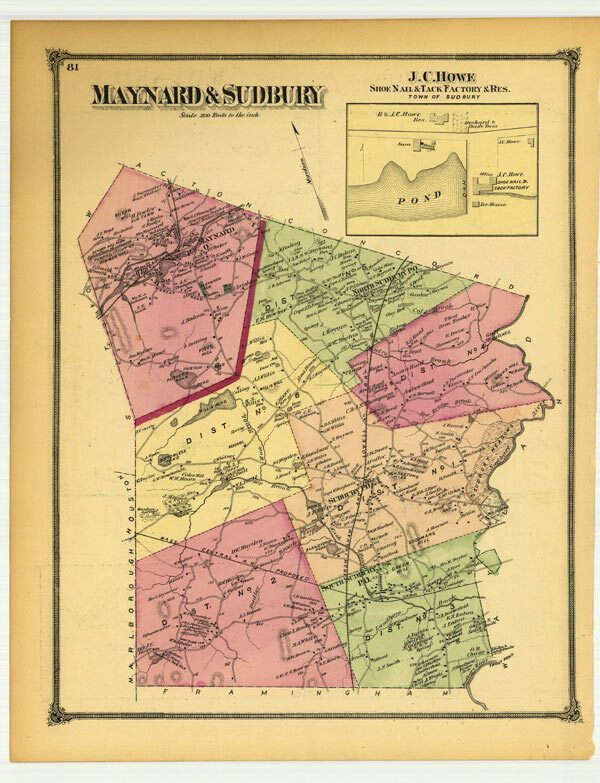 1875 Beers: County Atlas of Middlesex Massachusetts 1875 by F.W. 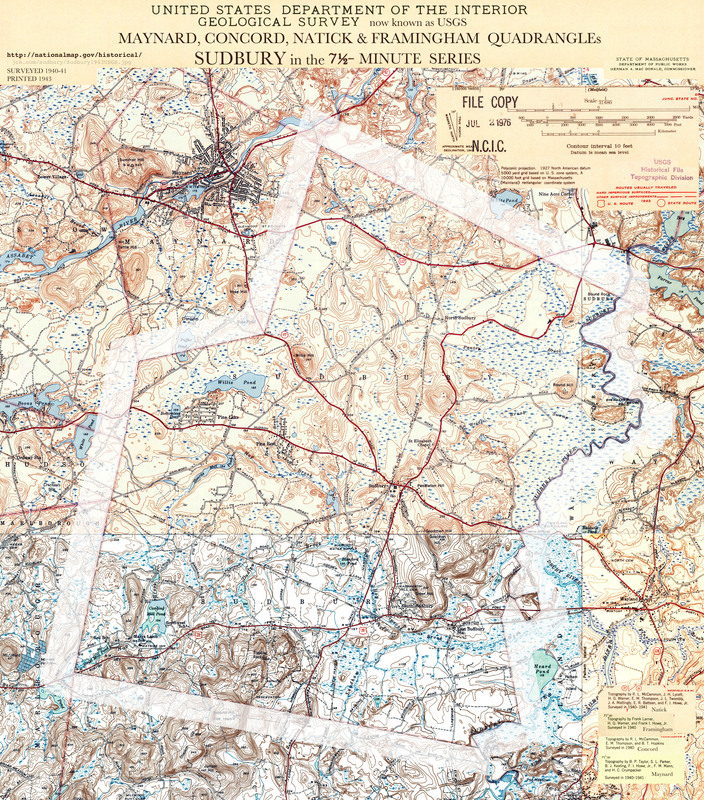 Beers & Co. 3 maps: South Sudbury, Sudbury Center and Maynard & Sudbury. 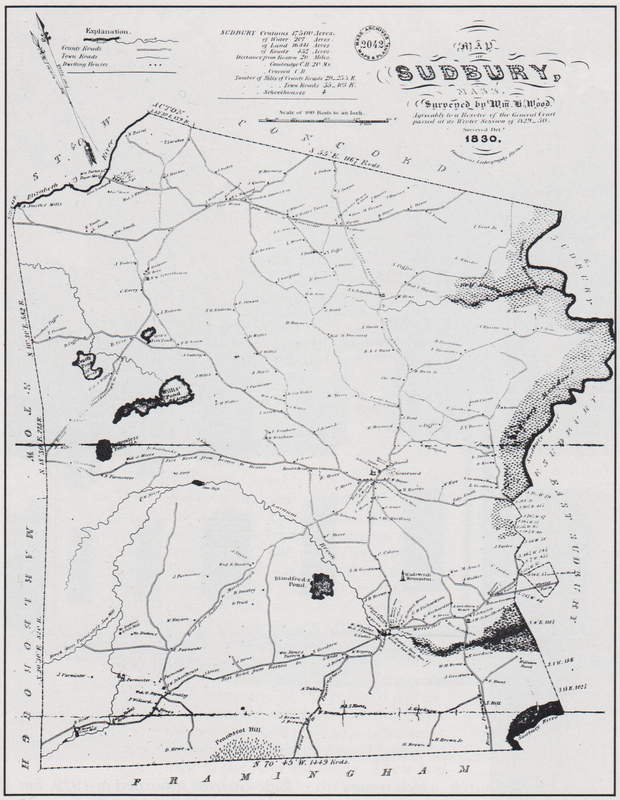 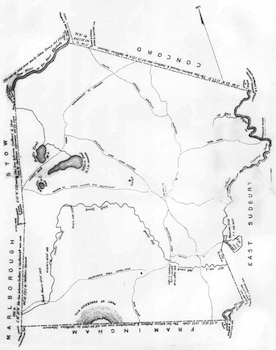 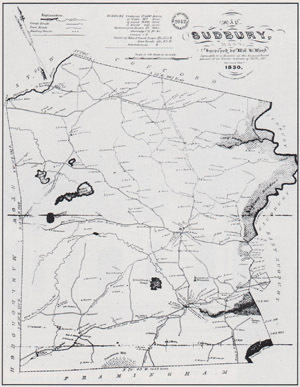 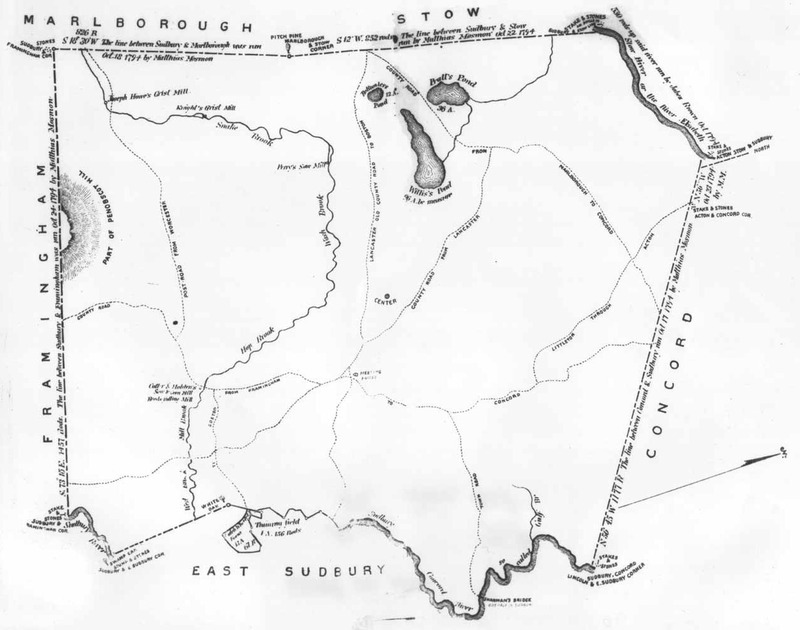 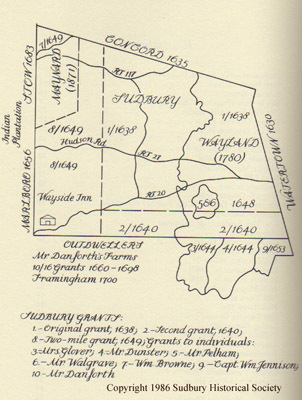 Right) Map showing land grants that formed Sudbury, from SHS book 1639 - 1939, originally a WPA book. 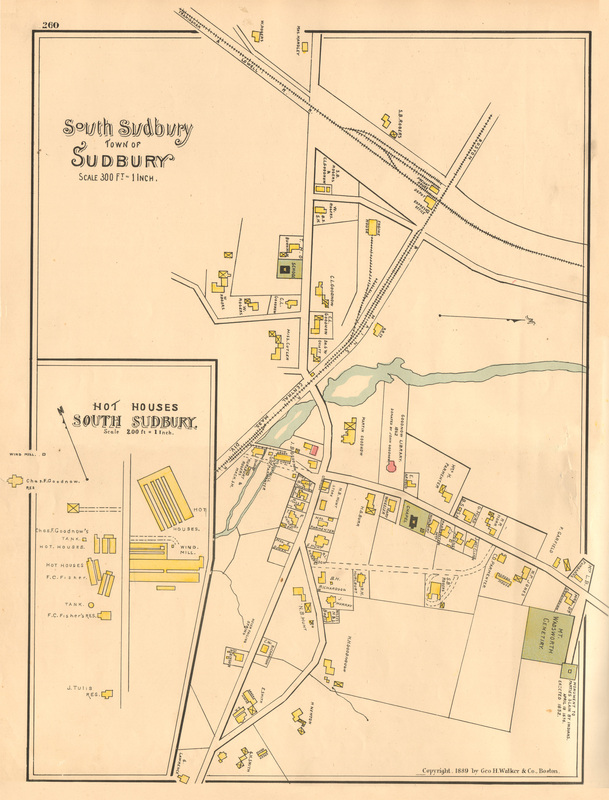 The Sudbury Archives is a COOL site that gets cooler all the time! 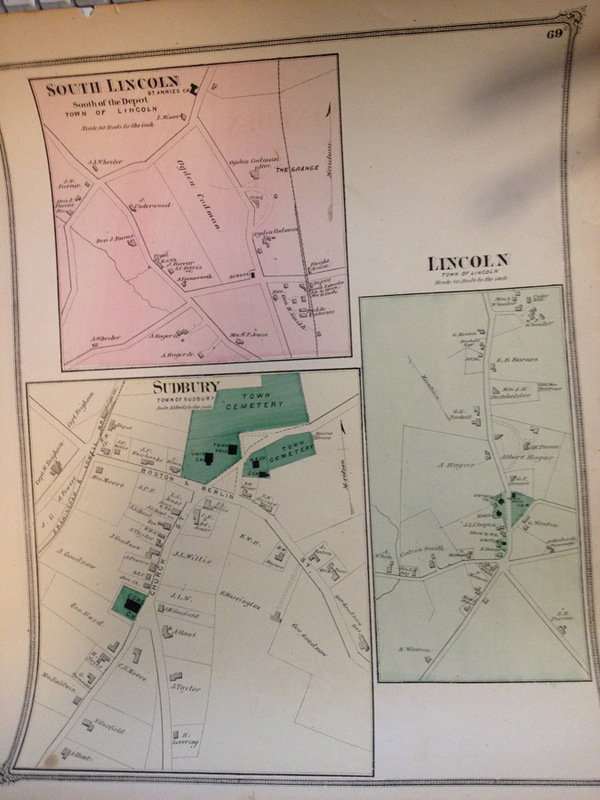 Then and Now map was designed & produced by Charles Way the Architect of the new 1932 Sudbury Town Hall, to commemorate the 300th Anniversary of the Town in 1939. 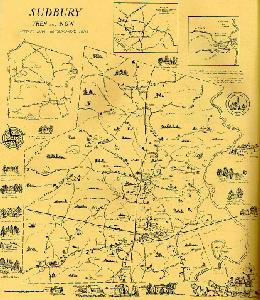 According to news articles I have read about the Celebration. 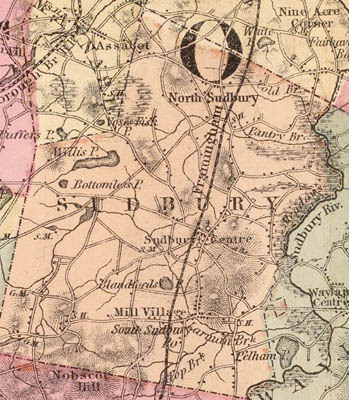 The original found its way to the Newton/Waltham bank (I think that was the name) where Pendleton's was for a short time at Mill Village. 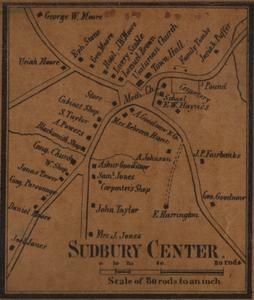 Dr. Bob M. got it from there, and it is as you photographed it on his wall. 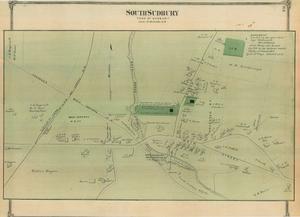 It is in color, it appears to be hand colored or painted, whereas all the copies I have seen were blue print type copies (blue on a white background) as we have in our Collection. 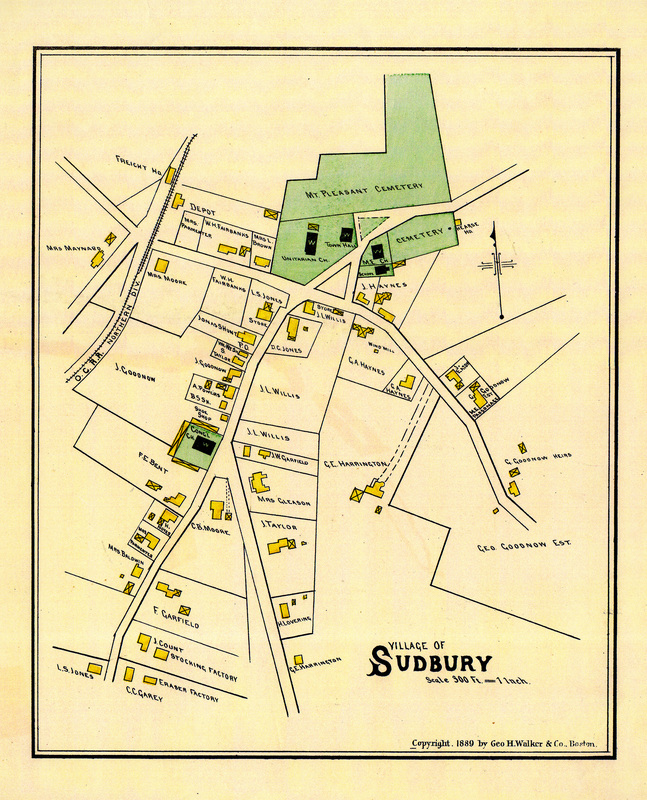 You have only a small section of the 1650 Map of Sudbury, that Sumner Chilton Powell had made for his book 'Puritan Village'. 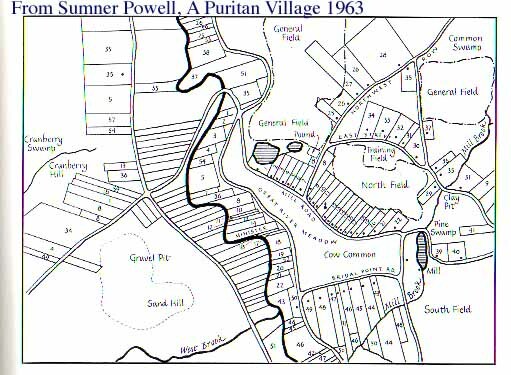 One of our SHS members in Rhode Island, collected & read every edition of Puritan Village that was printed while Powell was alive. Powell kept updating his foreword, and in one he stated that he gave the SHS his Maps. 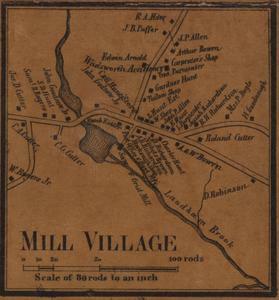 Ms. Caroline Miller called from R.I., and came up to look at them, and we discovered that because Forrest Bradshaw (late Town Historian) had written his initials on them, they were in his Collection. 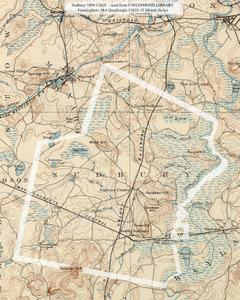 Chuck Z. 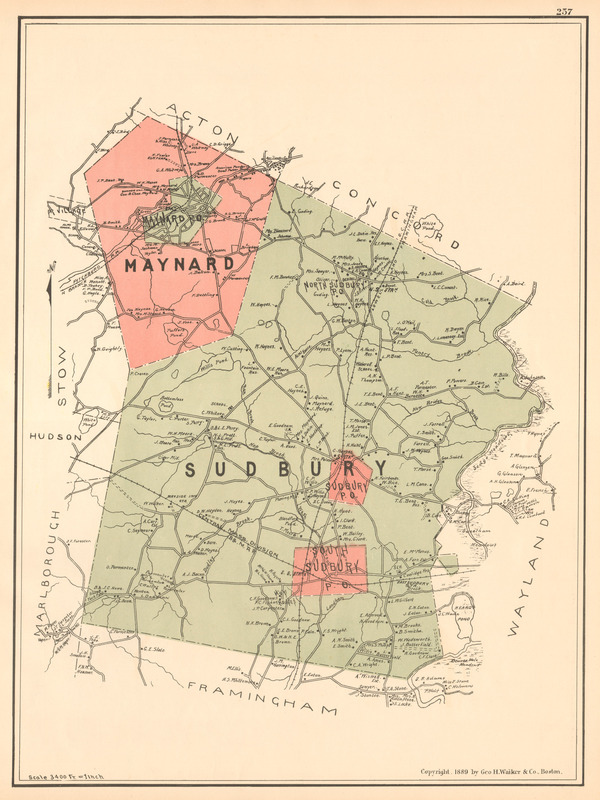 (our Tech man, whom you have met) then photographed them, and using I believe a GPS maps joined Sudbury & Wayland, and printed it, then made overlays of Powell's maps, so a founding family could find their ancestral plot or plots (from a list drawn up by Powell of the Landholders with a #) as of Sudbury circa 1650. 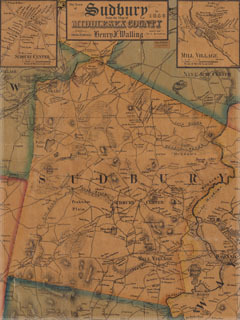 Every founding family visiting, that has made use of the Map & overlays has wanted a reproduction of them, but they are very small (8"x10") and it is very hard to see the #s on the overlays. 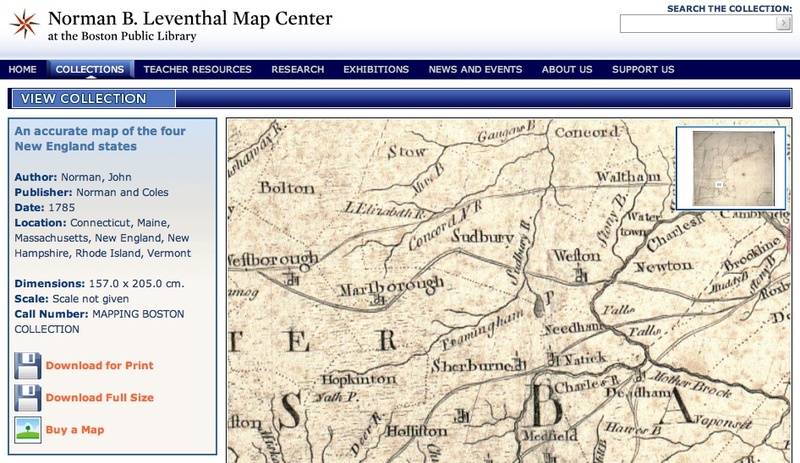 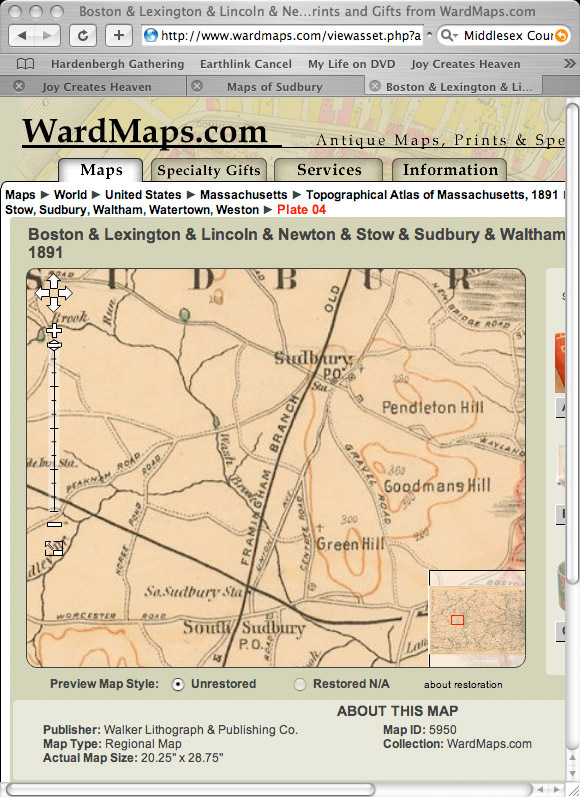 In talking with the publisher of Puritan Village, they expressed an interest in working with us to create a CD or DVD of the combined Map with digital overlays, that they would sell. 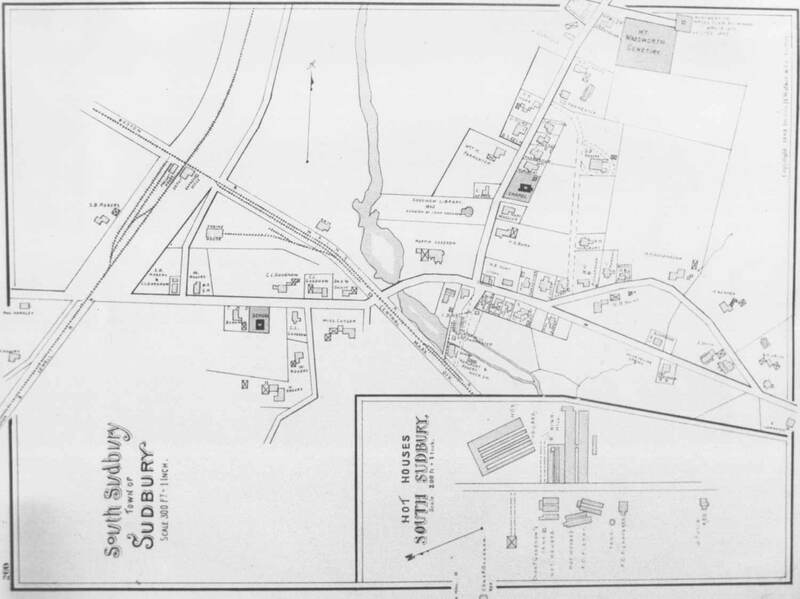 From: "YON - Jan C. Hardenbergh"
--I don't know a lot about the Walker firm, but I have handled piles of bird's-eye views produced by the firm. 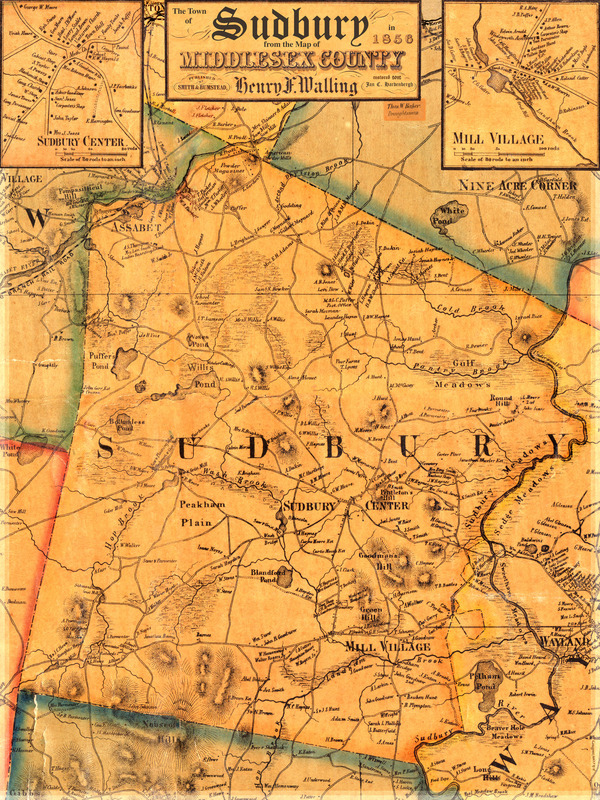 For a brief history of that firm, see Pierce and Slautterback's "Boston Lithography," p. 159. 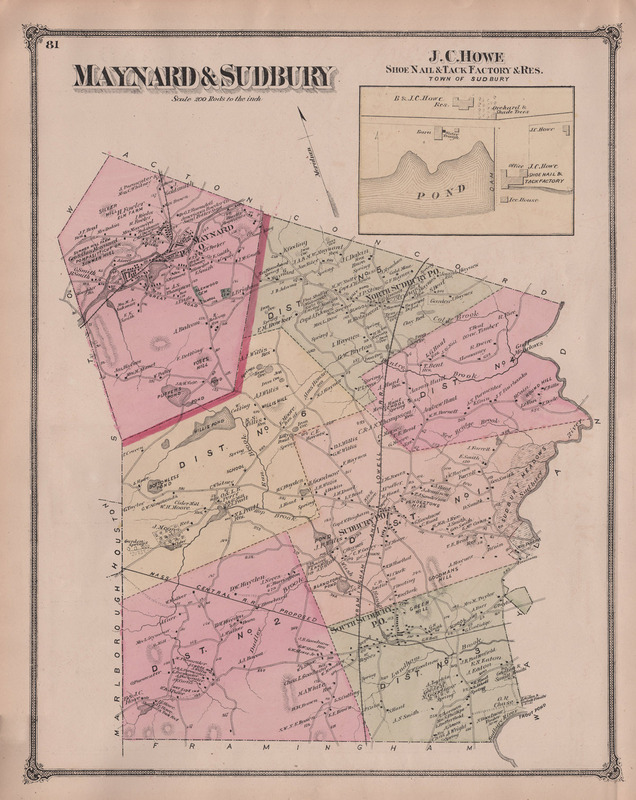 I don't care much for their maps, but they put out a large number of quite lovely chromolithographic views, of Boston, the White Mountains, Mt. 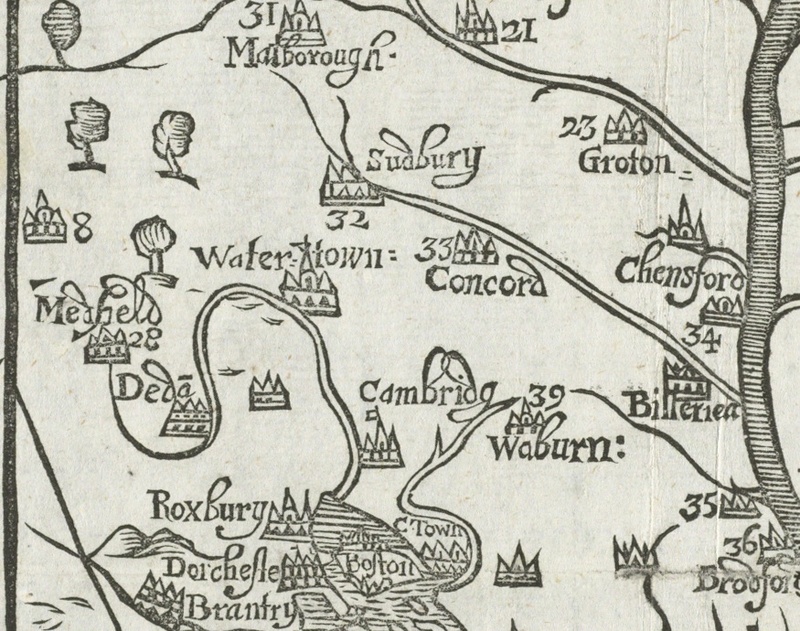 Washington, Casco Bay, etc., etc. 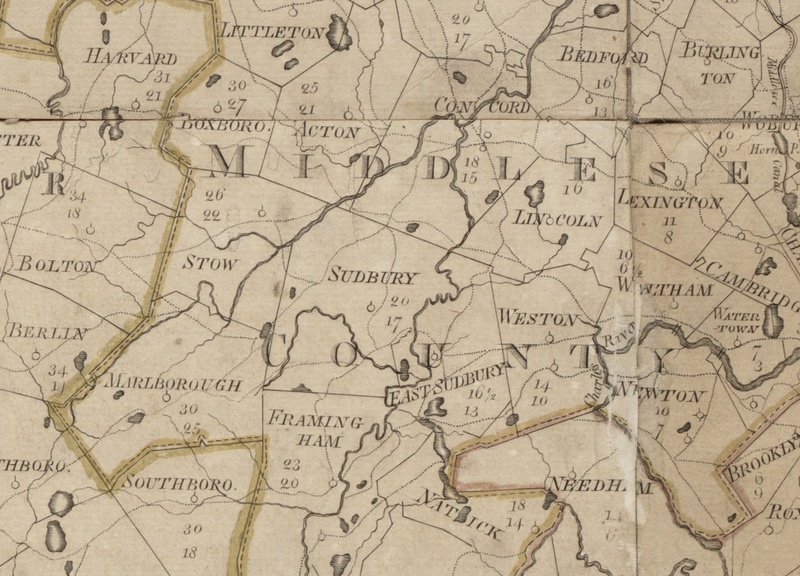 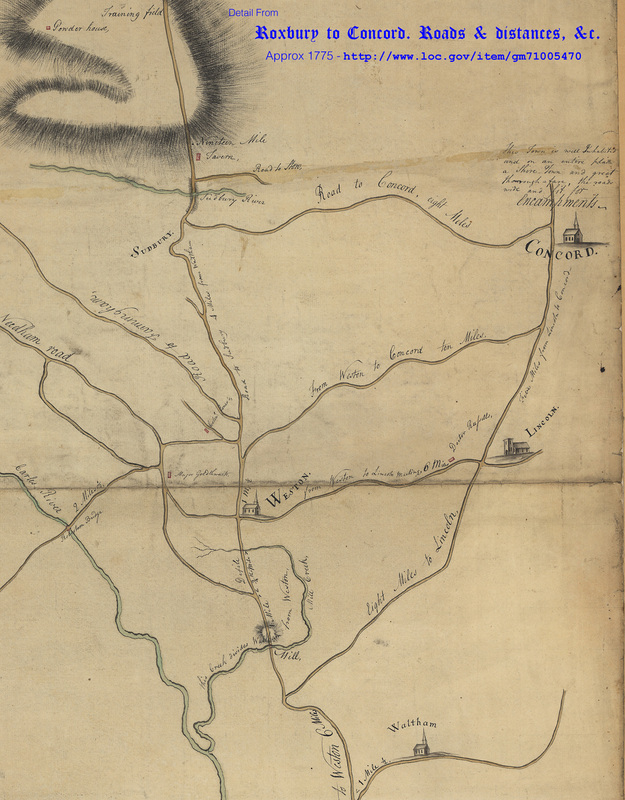 For future reference, I am always interested in buying early, rare and interesting American maps. 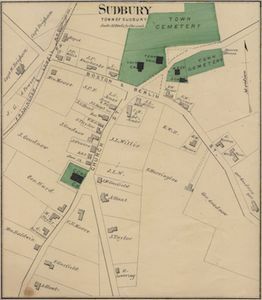 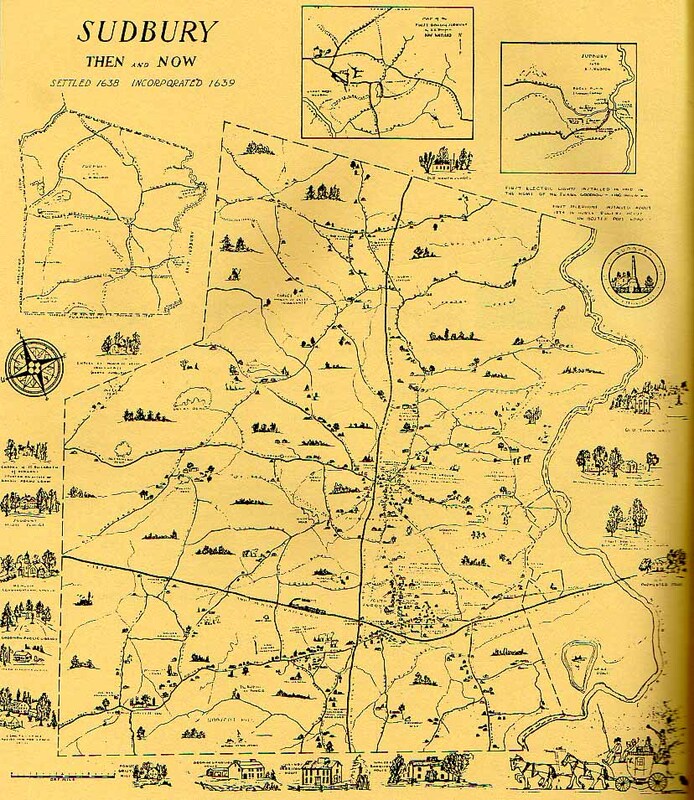 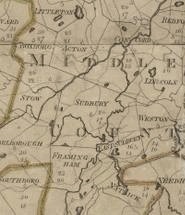 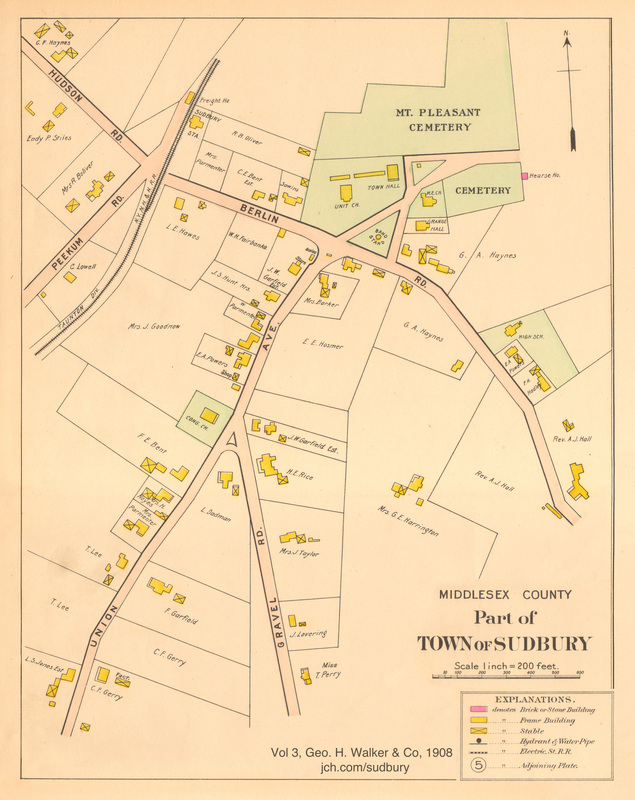 I handle lots of different kinds of material, but among other things would always be interested in early (pre-1860) maps of New England towns. 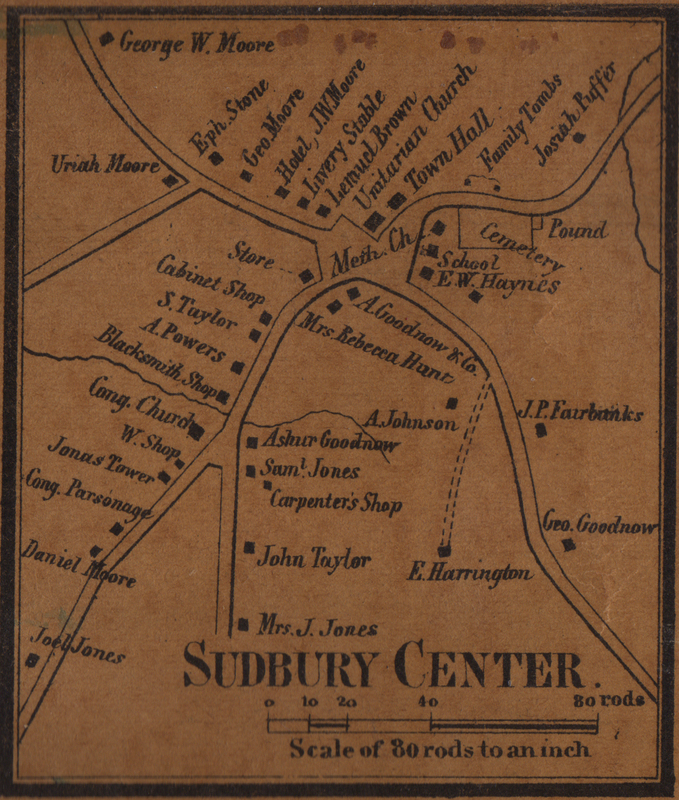 For instance, the Wood map of Sudbury is very, very rare, and if you ever knew of a copy for sale I would likely jump at it.